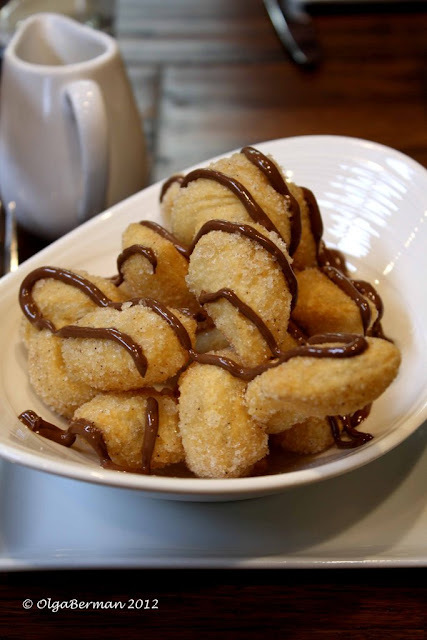 Have I professed my love for potatoes on this blog? I must have because I LOVE potatoes. My love for potatoes is endless! Potatoes are just so incredibly versatile, not to mention filling and inexpensive. Last weekend I decided to skip grocery shopping because I did not want to leave my condo and head into the cold rainy gray day. But I still had to eat! So I had to get creative with the few things I had on hand. 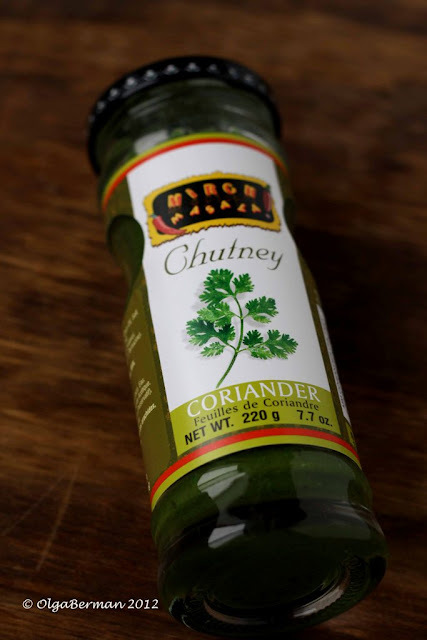 Potatoes, random vegetables, and a lovely jar of cilantro chutney from an Indian grocery store. 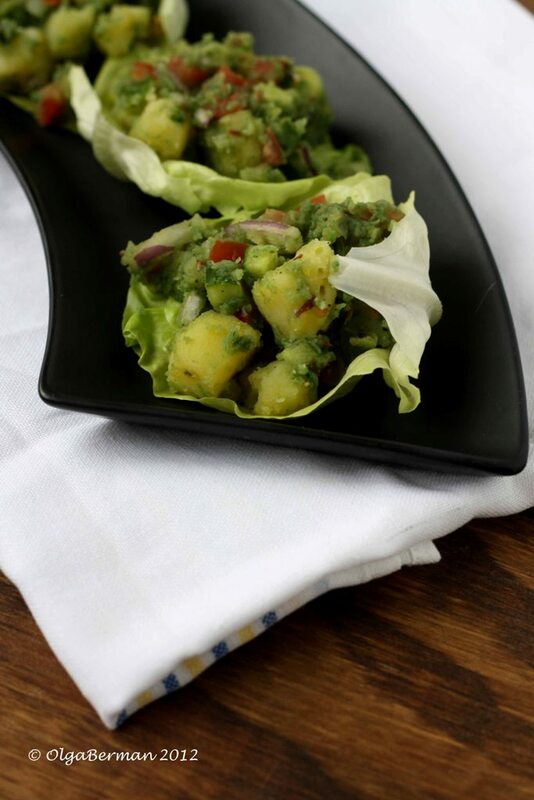 I decided to make up a recipe for Potato Salad with an Indian Twist. For those who hate mayonnaise (I don't understand you! ), this is a great alternative. 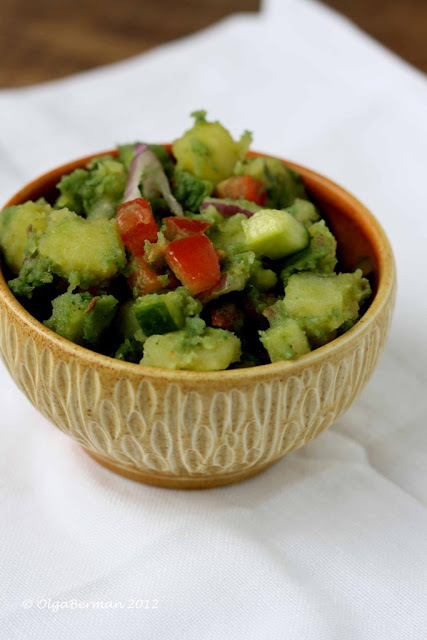 This salad packs a lot of flavor from the store-bought cilantro chutney and is relatively healthy due to the addition of tomatoes and cucumbers. 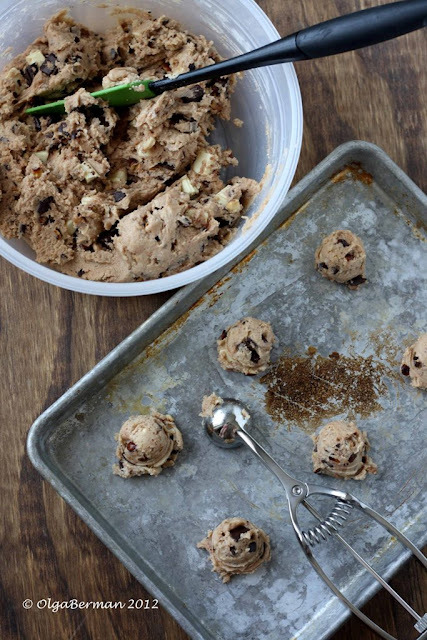 Make it soon and remember to pack it for your next picnic. *** Clearly you can use more or less of each one of these ingredients. These are just my suggestions. 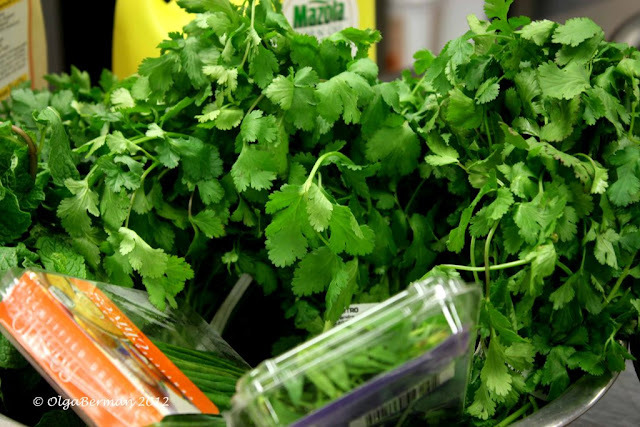 Also, if you have fresh cilantro, add it as a garnish on top of the salad. 2. 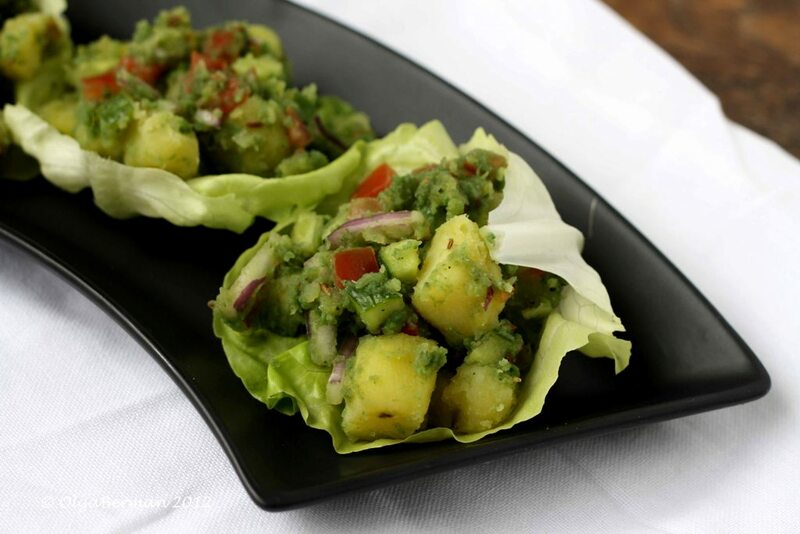 Serve on Boston lettuce. You can also serve this salad in a bowl instead of using Boston lettuce. As you are reading this, I'm enjoying this view and the company of the lovely Melissa ;) Don't hate! Last Friday, instead of going grocery shopping after work, I chose to torture myself at Nordstrom Rack. Why torture? Because nothing fit. I left frustrated, trying not to cry. 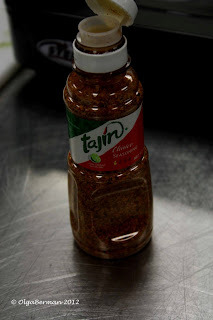 Yes, it's my fault: I've been eating too much without any physical activity other than a weekly salsa dancing outing. I know I need to change. What does any of this have to do with a recipe for Chicken with Olives and Oranges? Well, I woke up the following Saturday around 10 am, since I did not get home from dancing until 2 am. I looked outside and thought, "Screw it. I'm not going grocery shopping." The day was cold, gray and wet. Luckily, I had two chicken breasts defrosting in the refrigerator and had to do something with them. 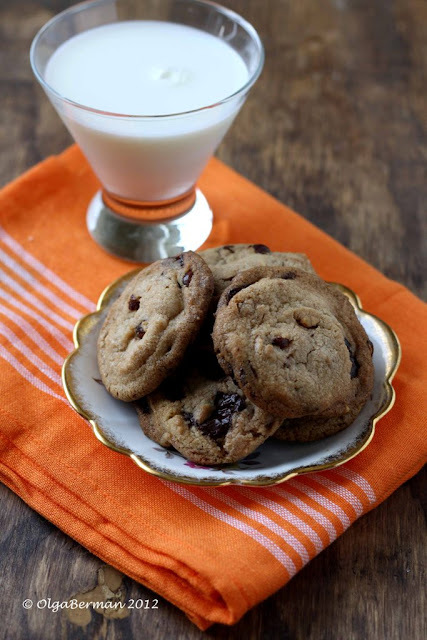 That's how I came up with an idea for this recipe. 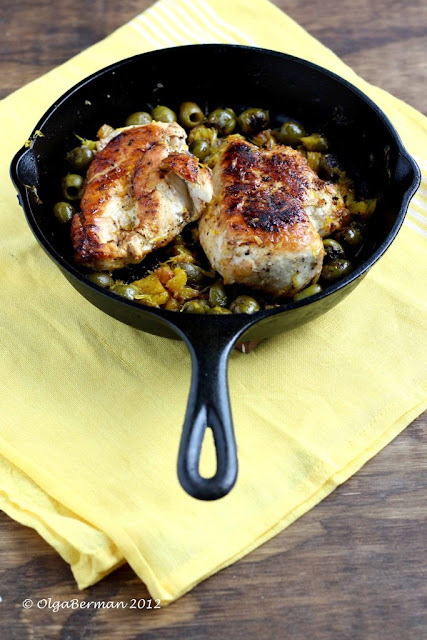 All you need for this recipe is chicken breasts, oil, salt & pepper, garlic, green olives and an orange. 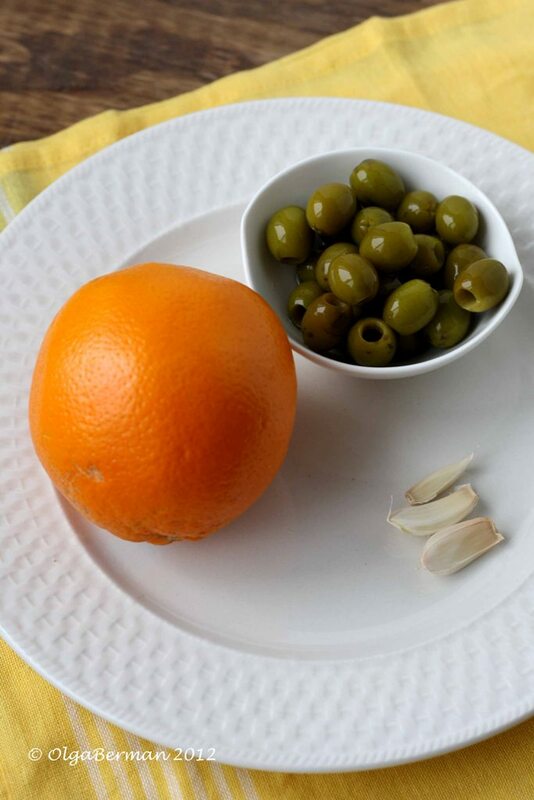 The saltiness of the olives and the sweetness of the orange play incredibly well together. If you don't have either of these ingredients, use capers and pineapple. 1. 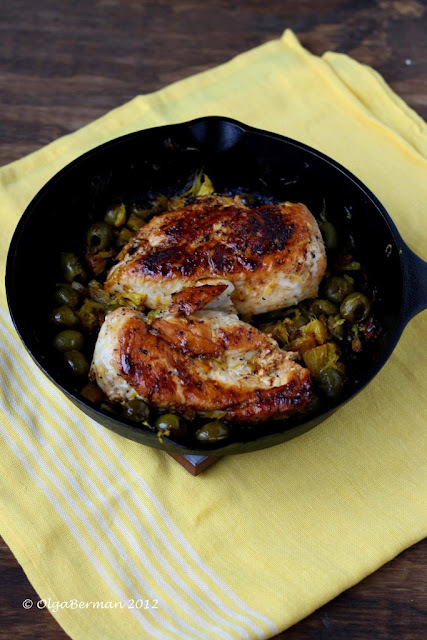 Heat a cast iron skillet or any heavy-bottomed pan on the stove. Add oil. Heat the oil. 2. Season chicken breasts with salt and pepper and sear in the cast iron skillet for five minutes on each side. 3. 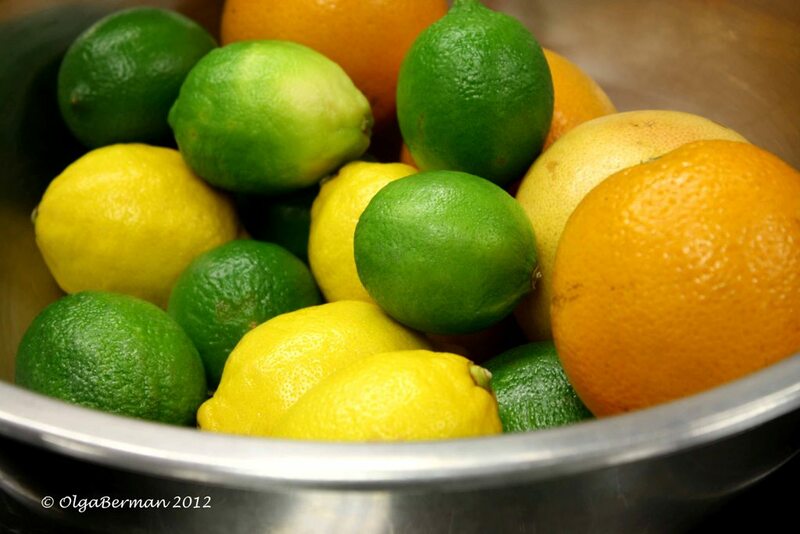 Add garlic, olives, orange segments and orange juice. Cover the skillet and cook for 5-10 minutes or until the internal temperature of the chicken breasts reaches 165F. Don't freak out when the orange segments fall apart: you did not do anything wrong! That's just what happens when you cook fruit. Also, you'll notice that the olives turn a gorgeous brown color and shrivel up a bit. 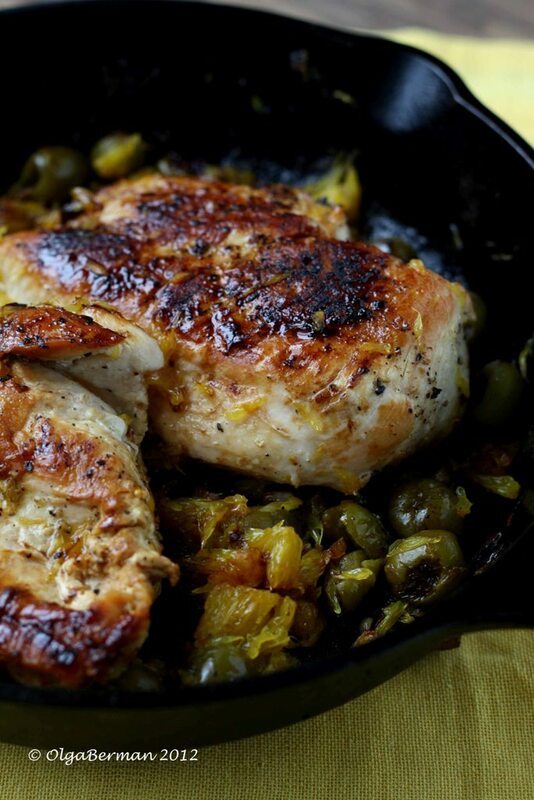 Cooking chicken breasts in an iron skillet is my favorite method by far. 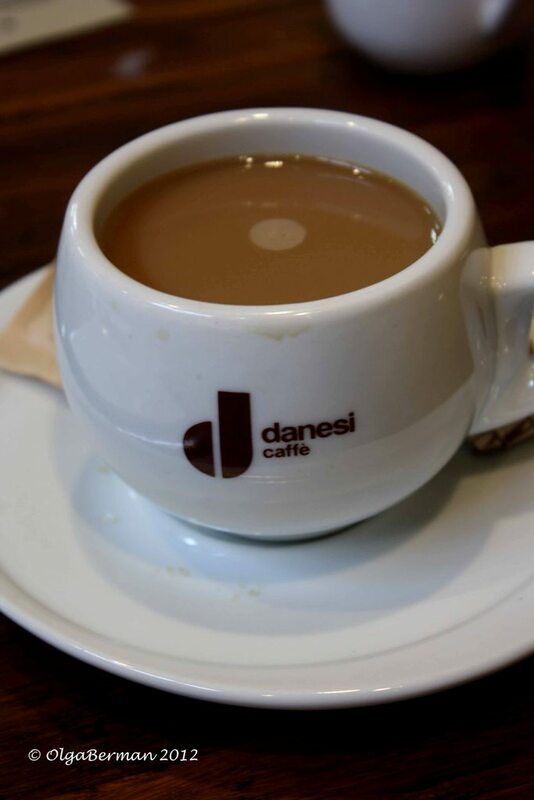 If you haven't tried it, what are you waiting for? 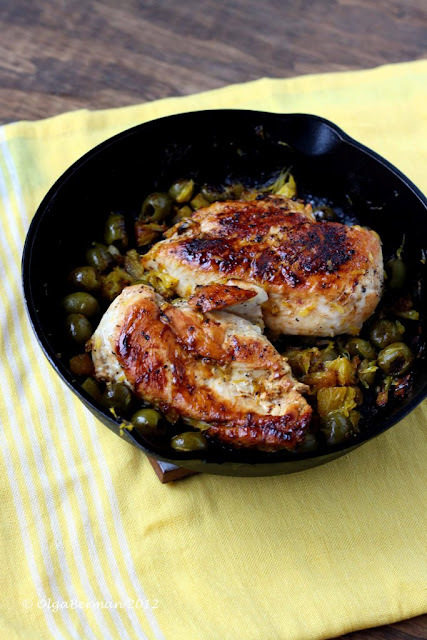 What do YOU make with skinless boneless chicken breasts? A while back, I received a box from Marx Foods filled with a bunch of little samples: grains, mushrooms, salts, etc. I used the mushrooms in a stir fry, and have seasoned countless dishes with Hawaiian pink salt, but the rest of the samples have just been sitting on my kitchen counter. Enough is enough, I thought! I needed to do something about this! 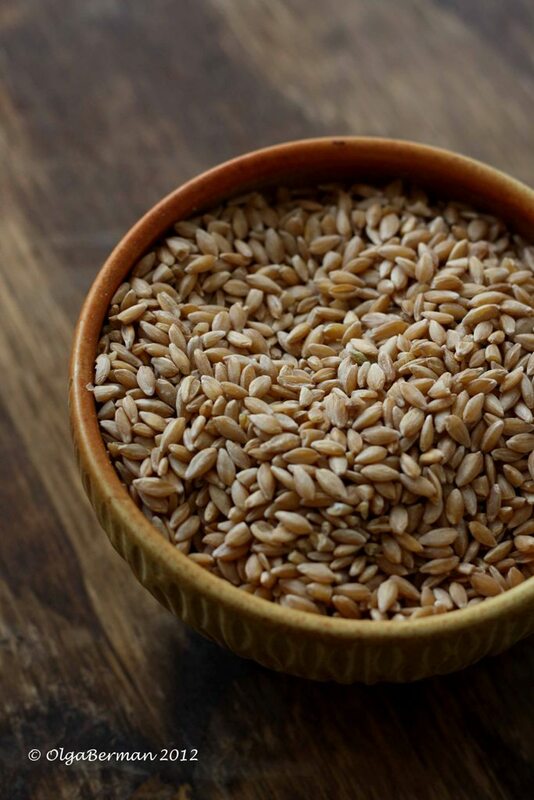 I took out a little plastic bag labeled einkorn and decided to come up with a recipe for it. What is einkorn!? I had never heard of it either. It looked like wheat berries, but I was too lazy to do any research on it. Lucky for you, there is a very thorough write-up about einkorn on Lost Past Remembered. Go and educate yourselves! 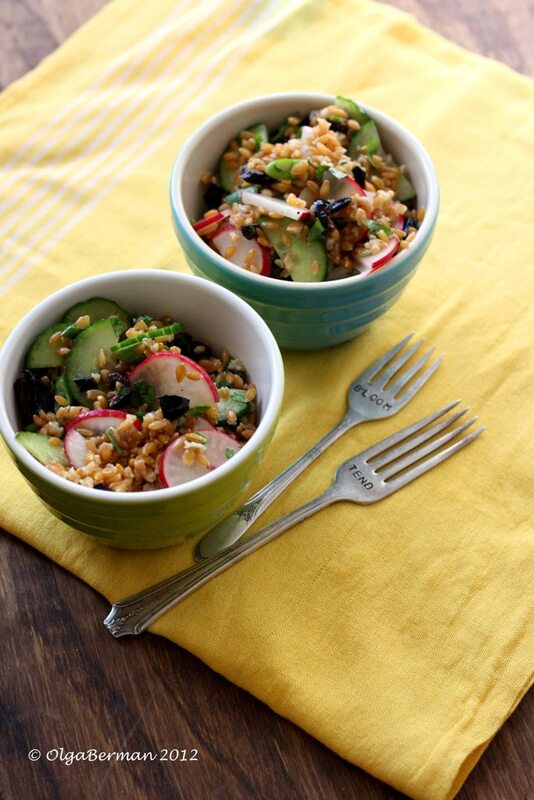 If you can't find einkorn, use brown rice. 1. 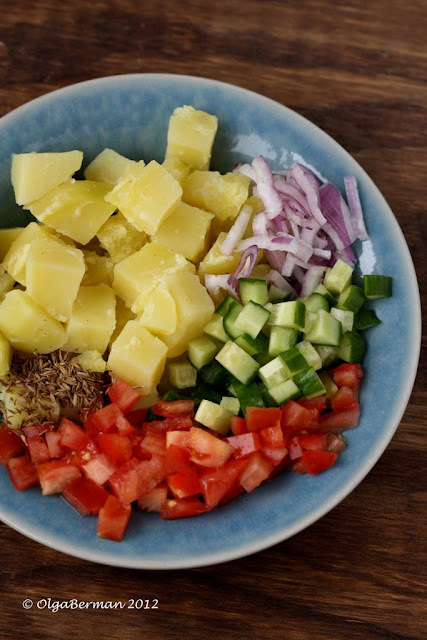 In a small bowl, whisk the salad dressing ingredients. 2. 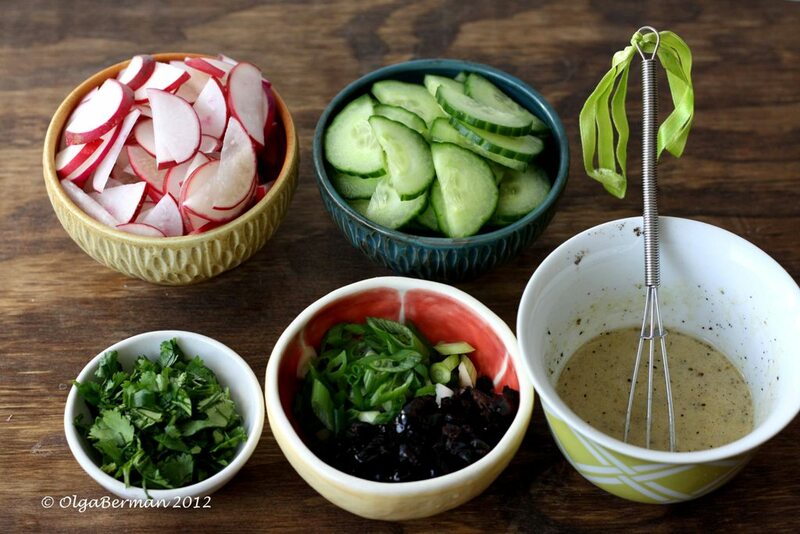 In a large bowl, combine the salad ingredients, drizzle with the salad dressing, and mix. This was such a filling, colorful and healthy salad. It's perfect for lunch or dinner, and is very fitting if you participate in the Meatless Monday movement. 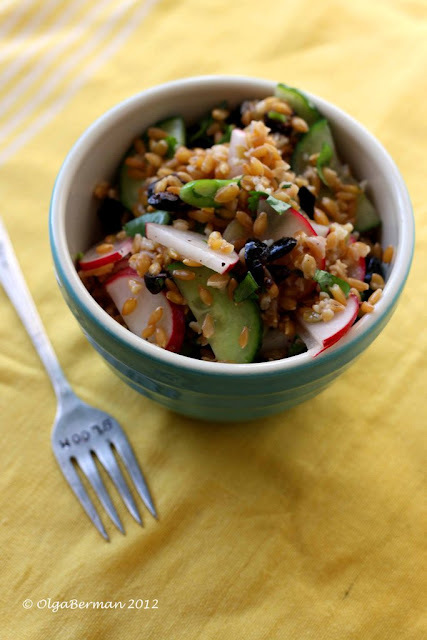 I feel like a broken record, but you can make so many variations from this one recipe: use brown rice instead of wheat berries, add red peppers, choose different herbs or oils, remove olives if you don't like them, etc. 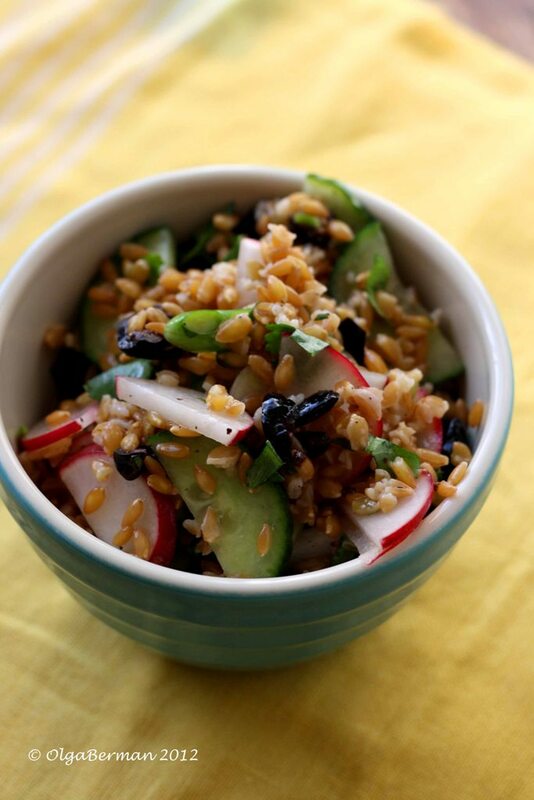 I loved the crunchiness of the radishes, the saltiness of the olives and the chewiness of einkorn. 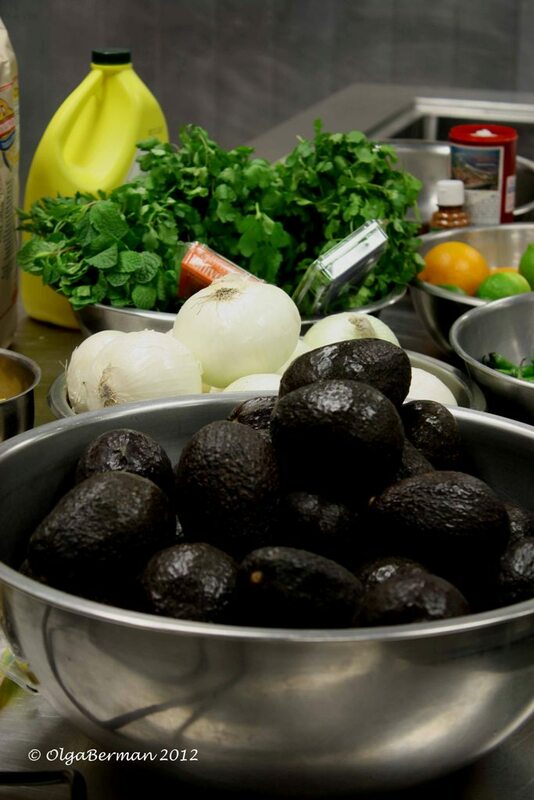 If you aren't looking for a Meatless Monday recipe, top the salad with grilled chicken or steak to make it more substantial, or add grilled Portobello mushrooms to keep it completely vegetarian. Sometimes, all you need is a lazy weekend without any particular things to accomplish other than cooking and photographing a few recipes, doing a bit of light cleaning while blasting Reggaeton, failing an attempt to exercise and planning a get-together with friends for brunch. Last weekend's agenda was just that! 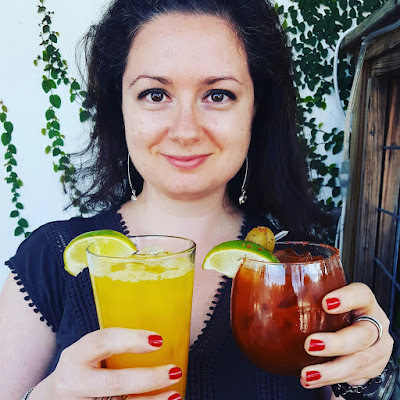 There are a zillion places in the DC area for brunch, and I love each of them for a different reason. 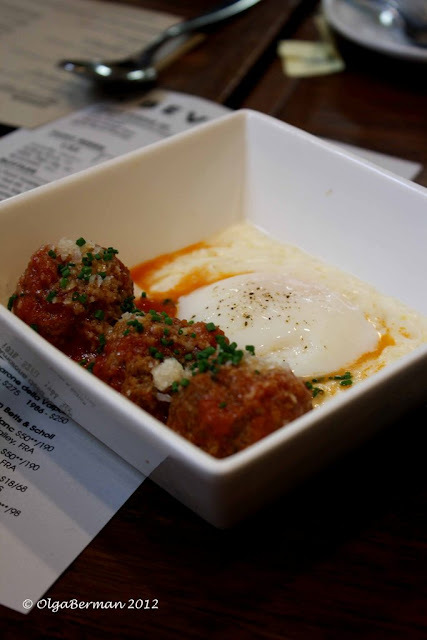 This time, my friends and I decided to check out the recently introduced brunch menu at Graffiato. After catching up on the latest happenings, we decided to order one of everything from the brunch menu and then add some items from Graffiato's regular menu. 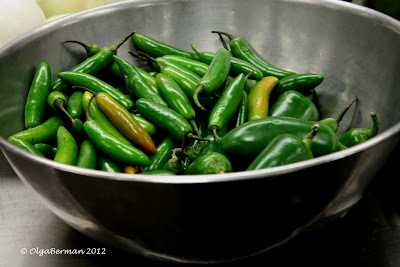 Below is a quick run-through of some of my favorite dishes. Another sweet dish on the brunch menu, Apple Calzone with whipped mascarpone, looked rather bland and unappetizing to me, so I skipped it. 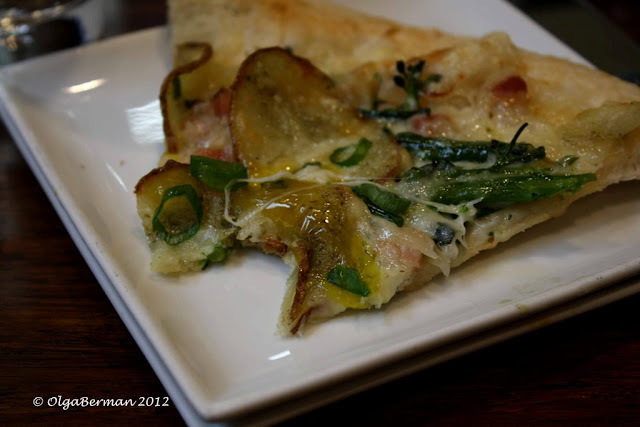 My second favorite dish was the Breakfast Pizza with bacon, potato, broccolini and cheddar. The thinly-sliced potatoes were crispy and slightly smothered in egg, the bacon added a bit of fattiness while the broccolini reminded you that spring is on its way. 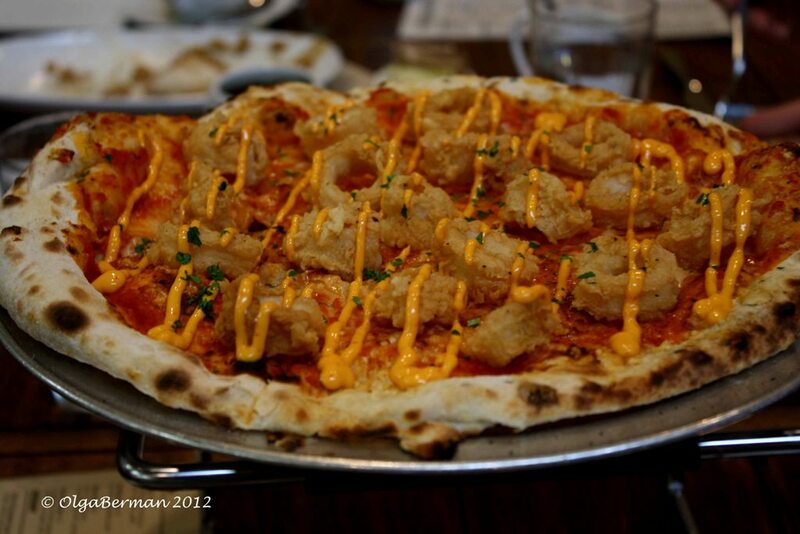 We also ordered Jersey Shore Pizza with fried calamari, tomato, provolone and cherry pepper aioli. To die for! I think Graffiato should serve a bowl of these crunchy calamari rings as an appetizer accompanied by the cherry pepper aioli. And, of course, we could not forget the pasta! 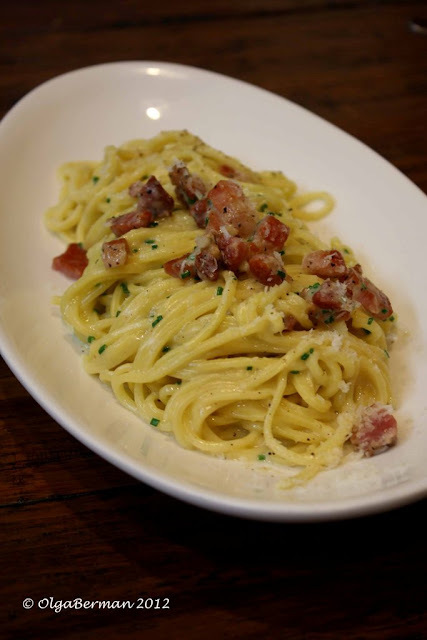 The Spaghetti Carbonara with pancetta, parmesan and an egg was delicious for brunch and made me incredibly excited for what's coming up this weekend: making fresh pasta with my friends Cecilia and Jenn. 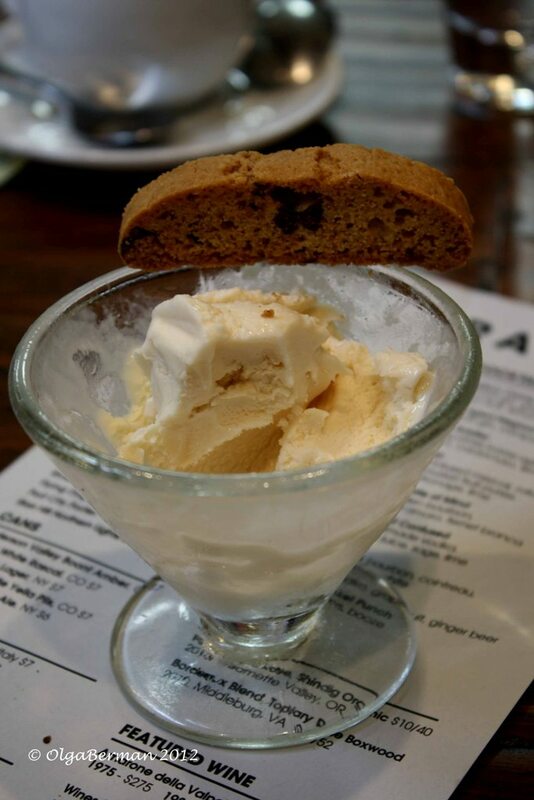 But then we decided to order one more thing: peanut butter gelato. What a sweet end to a fun brunch with friends! 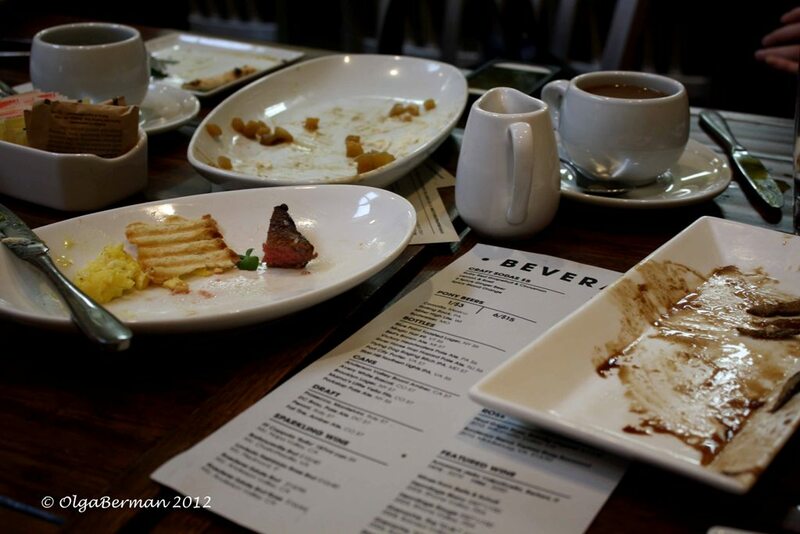 I look forward to more brunch dates with these great girls: Nikki, K, Cecilia, Jenna, Melissa, Daphne and Michelle. 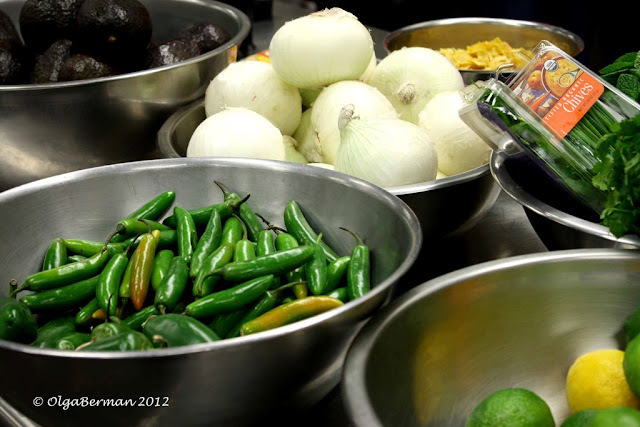 PS Remember you have until Monday, March 26th to enter the OXO giveaway I'm hosting. 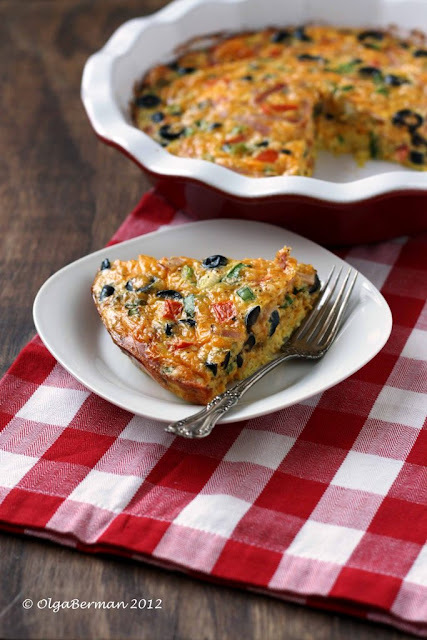 There is a little bit of a story behind this Tomato Olive Frittata. It all started last year when I volunteered at the Eat Write Retreat. One of the corporate sponsors was Lindsay Olives. Because I'm a huge fan of salty things, I hung out at the Lindsay Olives table and sampled multiple varieties of their olives. 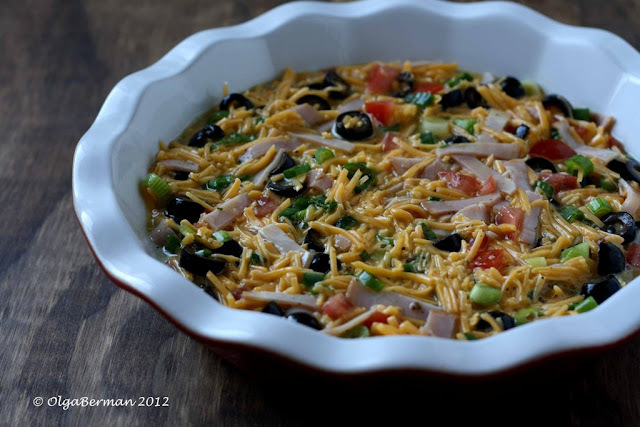 After the conference, I stayed in touch with Lindsay Olives, and a few months ago they asked if I'd like to photograph one of their recipes. I said yes! Why did I choose Tomato Olive Frittata? The recipe has only ten ingredients, requires very little preparation time and can be served for breakfast, brunch, lunch or dinner. It also has one of my favorite things in the world: tomatoes! Plus, this recipe is great for a crowd or for a single cook. It keeps well refrigerated for multiple days and can be reheated for a filling breakfast. Disclosure: Lindsay Olives sent me several varieties of their olives and paid for completing this project. 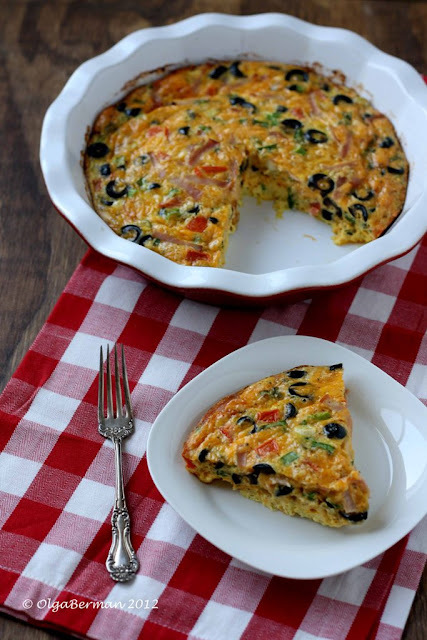 The recipe for the Tomato Olive Frittata is incredibly easy. 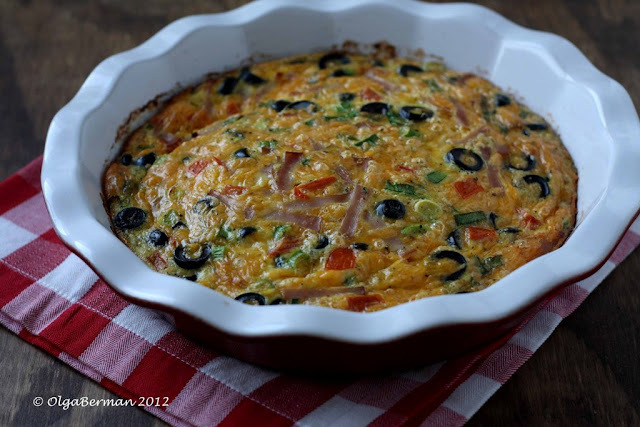 All you need are 6 large eggs, 1 tablespoon of flour, salt & pepper, 2 cups of shredded cheddar, 1 (3.8 ounce) can Lindsay Sliced Ripe Olives, 1/2 cup thinly-sliced green onions, 1/2 cup seeded chopped tomato, 1/3 cup thinly-sliced Canadian bacon and 1 1/2 teaspoons Italian seasonings. To make the frittata, whisk together one of the eggs with the flour. Add the rest of the eggs, salt & pepper and whisk. 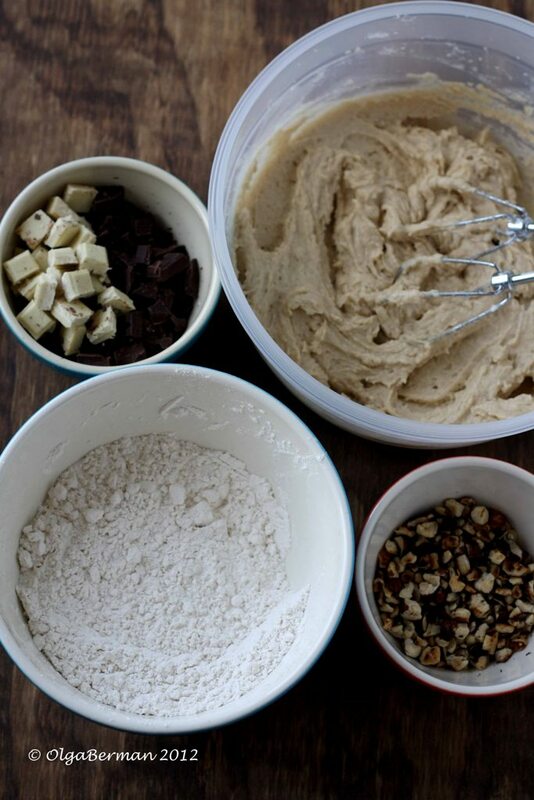 Incorporate the rest of the ingredients and pour into a round baking dish. Bake the frittata at 350F for 35 to 40 minutes. If you are watching your weight, you might want to cut down on the amount of cheese or use low-fat cheese. 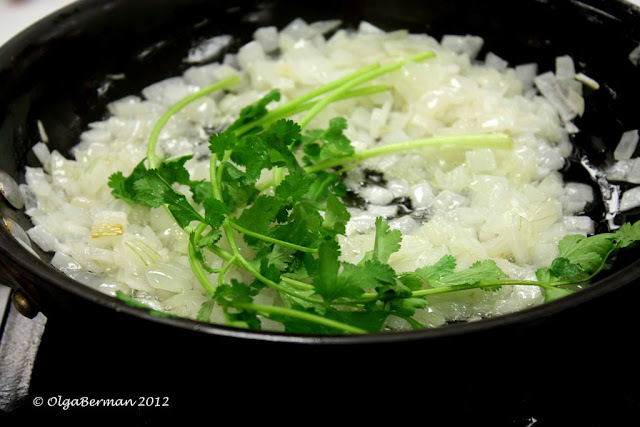 You can also add sauteed mushrooms and peppers to this recipe. If you are not a fan of Canadian bacon, leave it out or replace it with leftover shredded chicken. This recipe actually reminds me of "omelet surprise" breakfasts my parents used to make on the weekends. 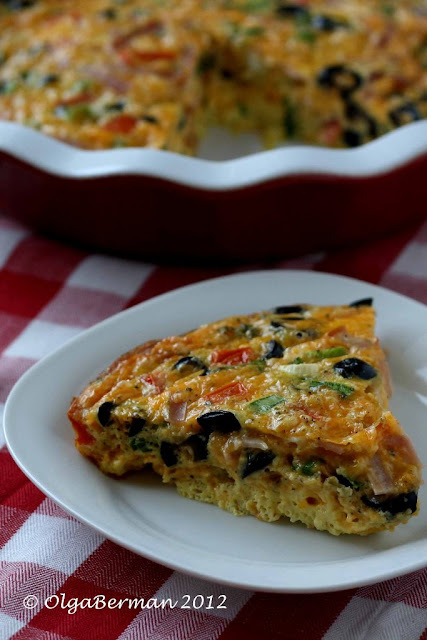 They'd use whatever leftovers we had from weeknight meals to make a variety of fluffy omelets. To learn more about Lindsay Olives check out their website and Facebook page. 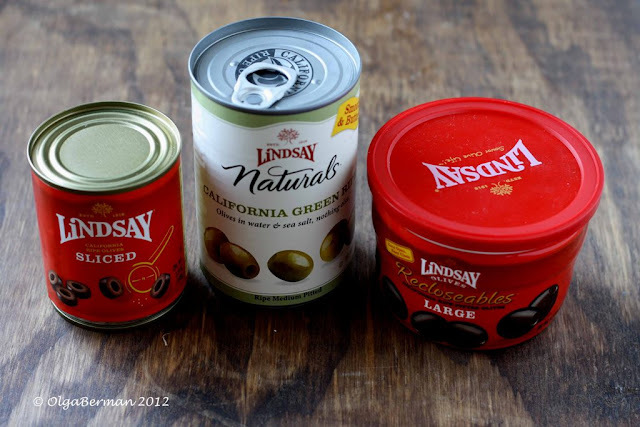 What are your favorite types of olives? What do you like to do with them? PS Remember you still have time to enter the OXO giveaway I'm hosting. 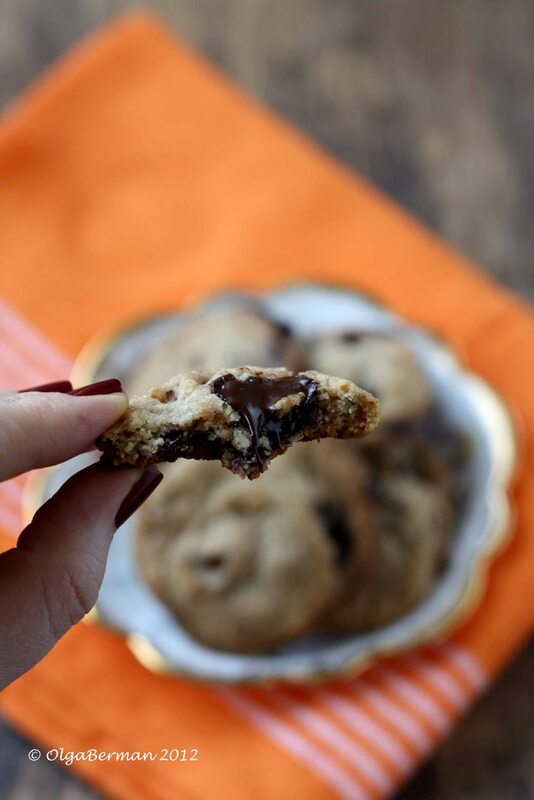 How would you like to win an OXO scale? As part of OXO Blogger Outreach Program, I had a chance to request an OXO product to try out at home and to share with one lucky reader. Guess what? I'm a spaz... I completely forgot that I requested to test out a scale, and ended up buying another scale on a big sale at Marshall's. My absentmindedness is your luck: instead of giving away one OXO scale, I'll be giving away two! Why might you want an OXO scale? 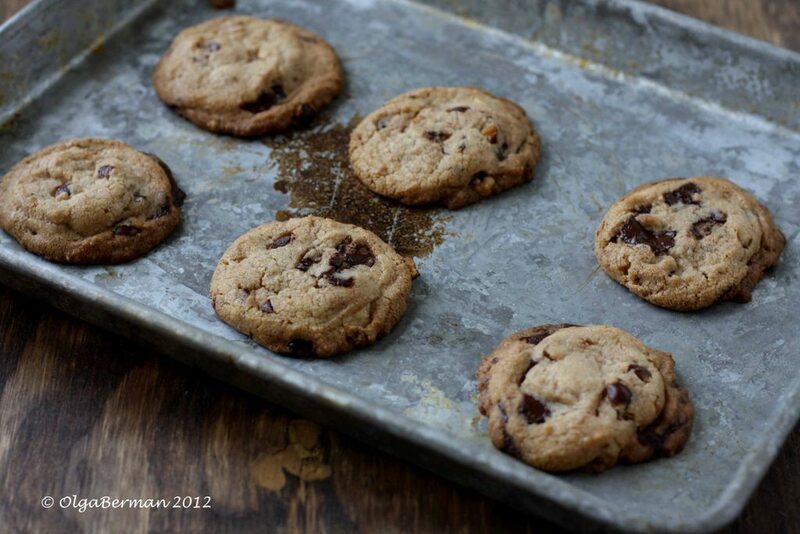 If you are a baker, having a scale helps you make more precise and consistent recipes. 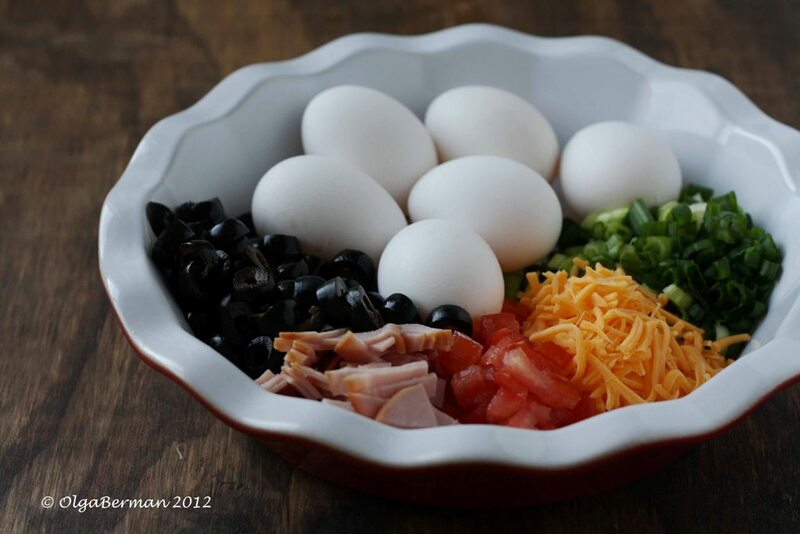 If you are trying to eat healthier, having a scale makes portion control easier to manage. 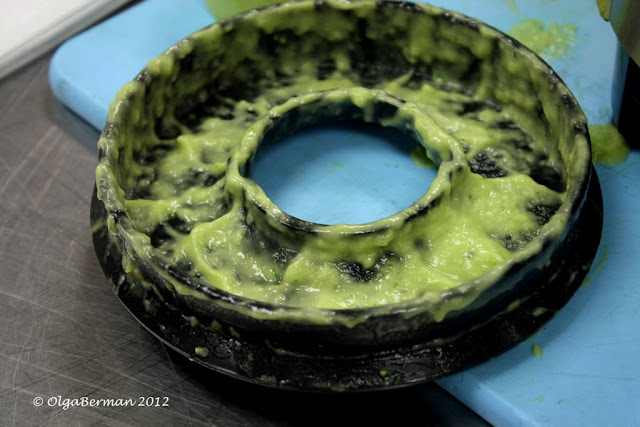 It's just one of those kitchen tools that you'll find yourself using over and over again. This particular scale is great because it's lightweight, comes with batteries and takes up very little space in your kitchen cabinet or drawer. In fact, you might want to leave it out on your counter because of its little footprint. 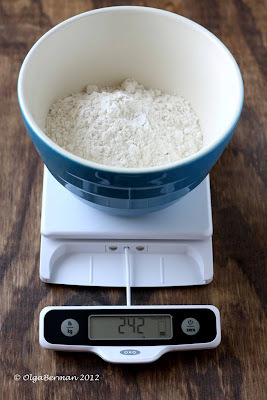 "OXO’s user-friendly Food Scale with Pull-Out Display is perfect for weighing all ingredients. Weigh items directly on the platform, on a plate or in a bowl, and pull the display away from the base to prevent shadowing from large plates and bowls. 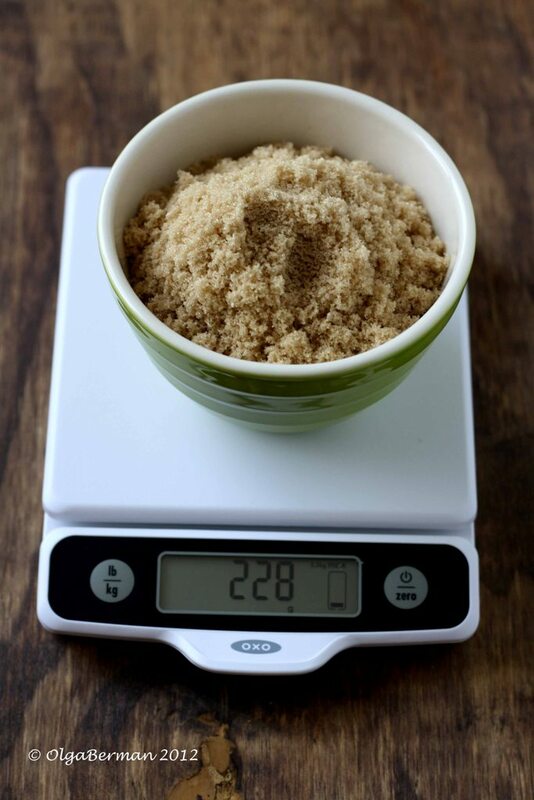 Accurately measure ingredients when cooking and baking or stick to a diet by weighing portions. A weight indicator shows the capacity left on the Scale before maximum capacity is reached. Press the zero button to offset the weight of a container or to set the weight back to zero so you can add additional ingredients. The display features large, easy-to-read numbers which measure in 1/8-ounce (imperial) and 1-gram (metric) increments. The plastic platform can be removed for cleaning. 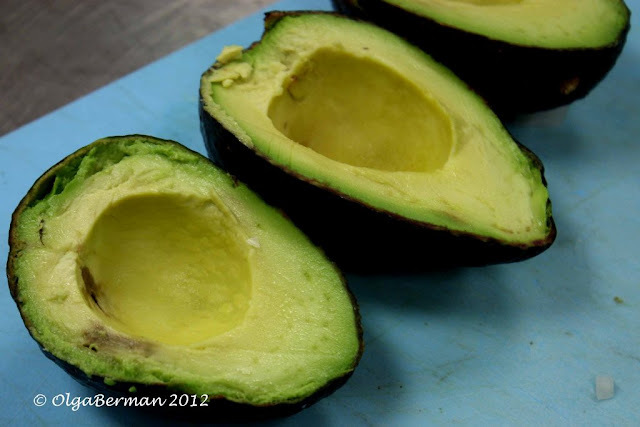 The Scale has a 5-pound capacity and two AAA batteries are included." 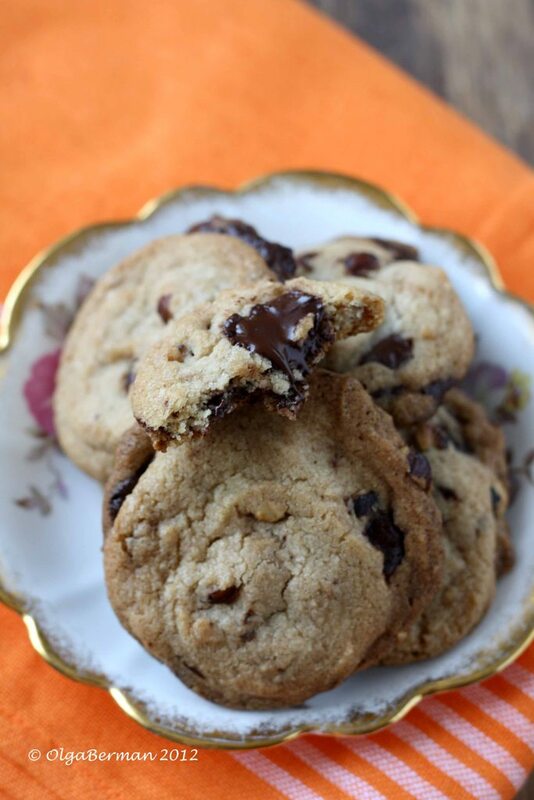 Before I tell you how you can have a chance to win this scale, I'd like to share a recipe for Chocolate Chunk & Hazelnut Cookies adapted from Baking Basics and Beyond by Pat Sinclair. ** I used Green & Black's Organic Chocolate I won from a twitter giveaway from Green & Black's Organic Chocolate and The Duo Dishes. 1. Preheat the oven to 375F with an oven rack in the middle. 2. Mix flour, baking soda, and salt in a medium bowl. 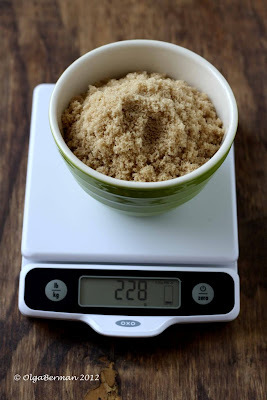 shortening, brown sugar and granulated sugar, scraping the mixture down a few times. Add vanilla and egg and mix well. 4. Combine wet and dry mixture until dough forms. 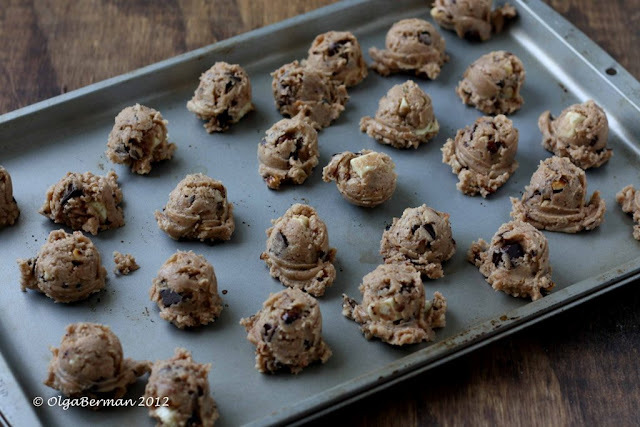 Carefully fold in chocolate chunks and nuts. 5. 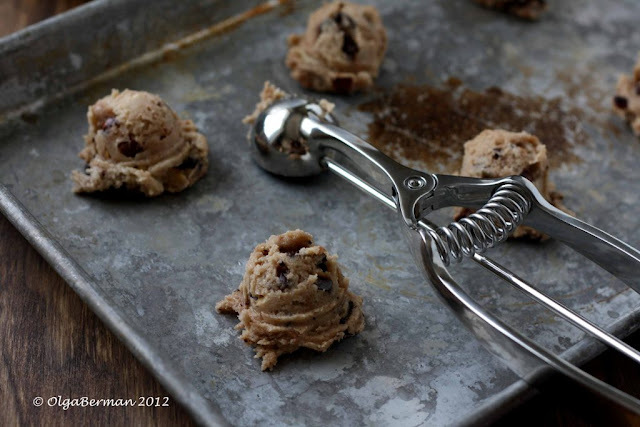 Using a 1-tablespoon scoop, form cookies and arrange them on a non-greased cookie sheet about two inches apart. 6. Bake the cookies for 8-10 minutes. 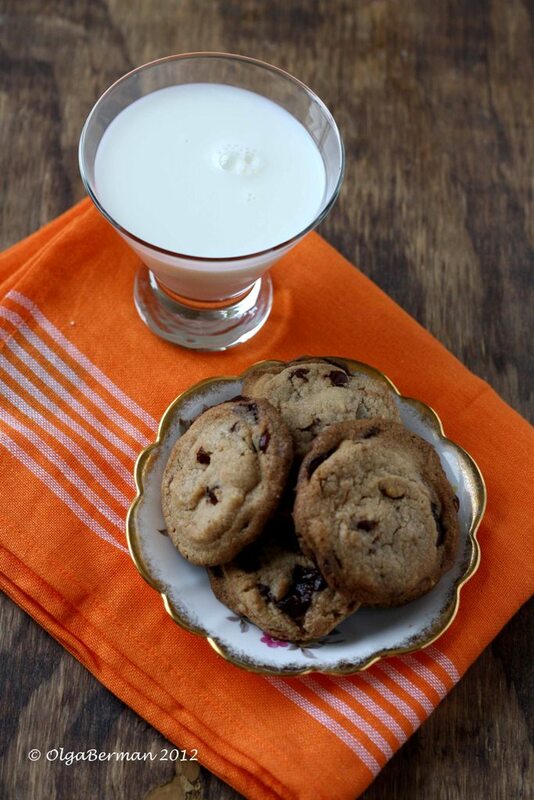 Serve cookies warm with milk. And now, I will explain how two of you lucky Mango & Tomato readers can win your own OXO scale! I will announce the two winners on Monday, March 26th! The comments are now closed! The winners of the giveaway are Ann Mathew and Meryl. 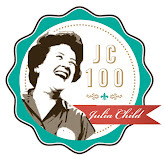 Congratulations!!! Disclosure: OXO sent me two scales. I was not reimbursed in any way for writing this post. All opinions are my own. Happy Friday! I'm not celebrating St Patrick's Day, but if you are, have a great time!!! 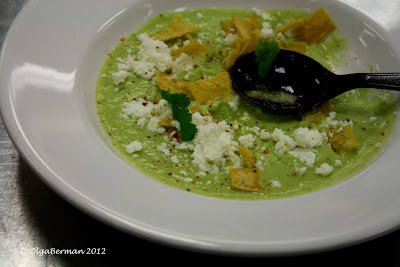 In case you came here looking for something green, I would hate to disappoint you, so here is a lovely avocado soup I learned from Patricia Jinich during Celebrating Food event organized by Les Dames d'Escoffier. You can make a zillion different variations of this soup, but the basic ingredients are white onions, jalapenos, cilantro, oil, chicken stock, lemon juice, queso fresco, fried tortilla chips, and, of course, avocados! 4. 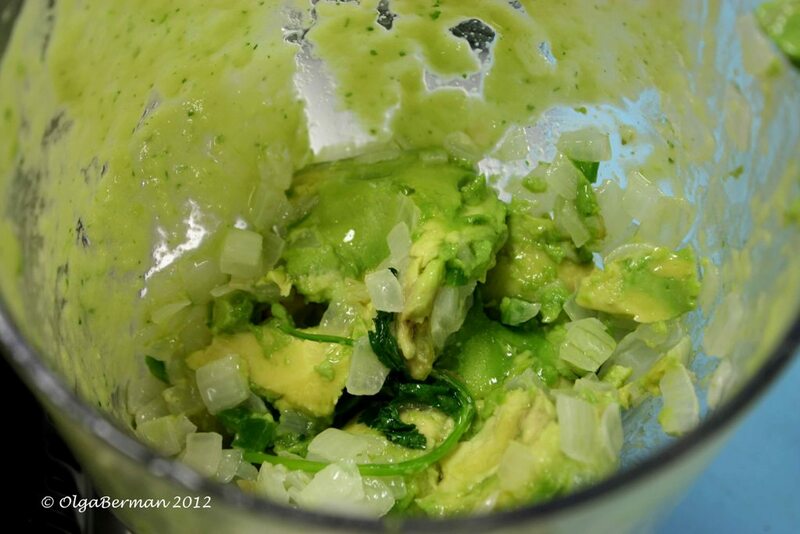 In a food processor, puree onions, cilantro, avocado, chopped jalapeno, lemon juice, and salt & pepper with hot chicken broth. 5. 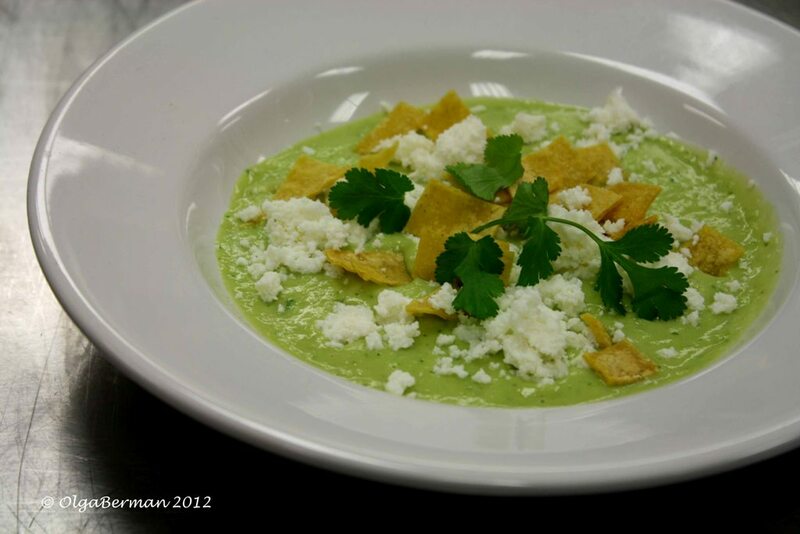 Ladle soup into bowls and garnish with queso fresco, fried tortillas, and cilantro. Variations: use Tajin spice to add a lovely citrus heat to this soup. The flavor is hard to describe, but is incredible. 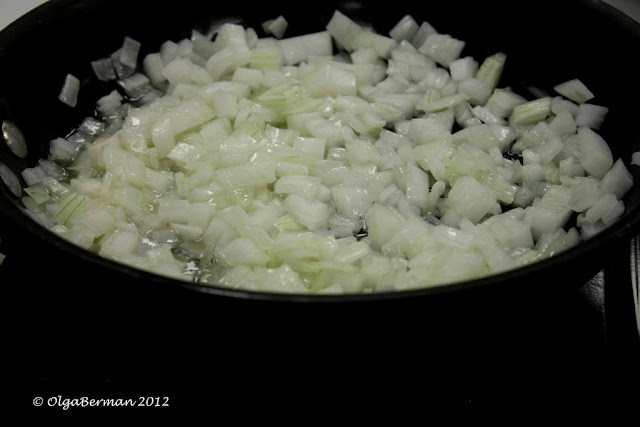 I intend to make this soup at home very soon and take better photographs!